Nvidia recently held their earnings call (via KitGuru) and the CEO Jen Hsun talked a bit about the upcoming Pascal architecture. As expected however, he didn’t reveal any new detail except rehash what is already known. He did hint that further details about the product will be “coming soon” and he can’t wait to talk about them. Pascal generation of GPUs will mark an important shift in Nvidia GPUs, shifting from GDDR5 memory to HBM2 – resulting in a huge leap in bandwidth. Pascal GPUs are slated to be pretty damn amazing. They will feature 4X the mixed precision performance, 2X the performance per watt, 2.7X memory capacity & 3X the bandwidth of Maxwell. Considering the fact that Nvidia’s color compression technology is already phenomenal, I am excited to see what a Pascal GPU with the same tech and massive bandwidth can offer. The PCI-E bottleneck remains as always – but that is quickly becoming irrelevant as more of the work is handled on-gpu thanks to the autonomy granted to the Graphic Processor by low level APIs such as DiretX 12. There are currently two Pascal cores that we know about – the GP104 and the GP100. The GP104 will be the GM204 successor while the GP100 will be the flagship Pascal GPU from Nvidia. Both will be manufactured on either the 14nm or 16nm node using FinFETs. Nvidia has been on the same 28nm node for around 3 years now but has managed to always deliver in terms of performance jumps per generation. Ofcourse, that will becoming exponentially difficult to maintain unless they shift to a lower process – something they plan to do with their next generation of GPUs. The use of HBM2 will let Nvidia put upto 32GB of video buffer on their GPUs and upto 1TB/s of bandwidth. 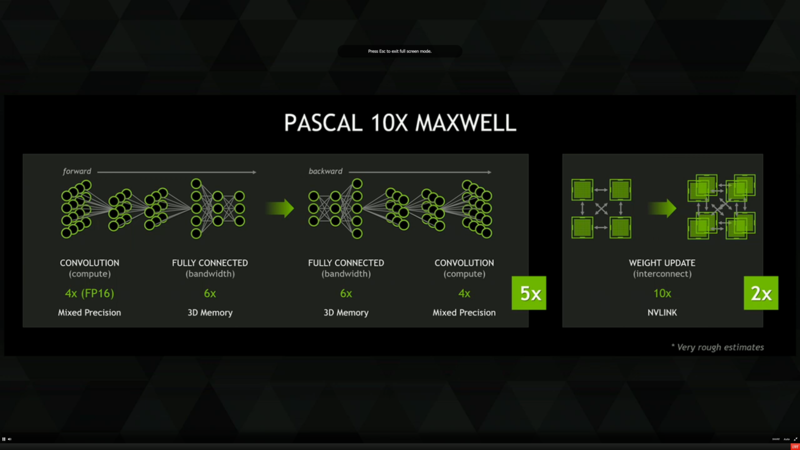 We were not able to spot any new details in the Earnings Call apart from what we already know, so that was basically a little recap on Pascal GPUs. Pascal Architecture is expected to succeed Maxwell Architecture and combined with DX12 should usher in a new era of Gaming prowess. With processors consistently and comfortably ahead of the demand curve, the onslaught of high resolution standards such as 4k have increased the pressure on better GPUs. Pascal could very well be poised to offer a lineup of one of the first 4K capable single-gpu cards at the 4k@60 fps standard.